I received a copy of Organizing for Your Lifestyle in exchange for my honest review. Over the past few months, my travel has taught me that minimalism has benefits that extend beyond your own home. I’ve been traveling with three bags since May of this year, and I packed them all with minimalism in mind. I have one bag for clothes, one for my health essentials (shampoo, conditioner, skincare, vitamins, etc. ), and one for my electronics and school essentials. Three bags has been a manageable amount to carry as one person, and they fit all of my essentials for my everyday life. Before I left on my summer trips, I read Organizing for Your Lifestyle by Jane Stoller for packing inspiration. 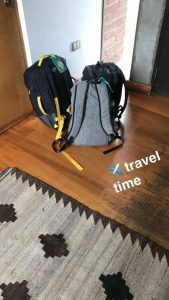 This was an amazing read that gave me ideas for both my home/dorm organization and for minimalist packing! One of the challenges this summer was packing for both cold and warm weather in one bag. It was winter in Chile, and very much summer in Costa Rica. 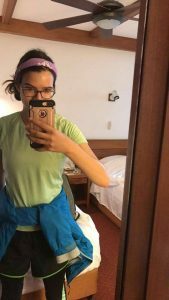 At first I was at a loss for how to pack for these two conditions, but Organizing for Your Lifestyle had wardrobe tips to help minimize what you carry and maximize your options. I was packing for both professional and casual settings, which can definitely be challenging with limited space. However, I learned that packing layers provided many opportunities for mixing and matching. You can see what I ended up packing for my summer journey here! I have been embracing a minimalist lifestyle since the summer of 2016, and have refined it to suit my lifestyle. As I have mentioned in previous posts, minimalism is about owning only what you use often—not about owning as few items as possible. I’ve found that eliminating excess from my life has allowed me to eliminate emotional weight and to feel more carefree. The Japanese have long been the experts on knowing how to have a minimalist dwelling, and Japanese organizing guru Marie Kondo’s best-selling book, The Life Changing Magic of Tidying Up (2014) is a gem for people who want to move toward a less cluttered lifestyle. Kondo places a lot of emphasis on keeping only items that give you joy, and getting rid of everything else. In her book, Kondo argues that it’s important to create a space in your heart for the things that really matter to you, and that it’s important to give thanks for these things—even literally, by talking to the items in your home. This might sound a bit “airy fairy” to some, but I found that Kondo’s insights helped me to really appreciate what I have, while reminding me not to accumulate stuff I don’t need. Kondo also warns against organizing too much, as this can actually create additional things, and additional clutter. One particularly valuable trick I learned from Kondo was to never keep all the extra buttons you get with the clothes you buy. I used to be very proud of my button collection, which was, of course, meticulously organized. However, I never used even one of the buttons; when I did lose a button, I would usually go to a tailor, and he would put on a new button that matched. But my button collection just kept growing. When I do feel it’s important to keep a button—from an expensive or unique coat or blazer, for example—I sew it on the inside. De-clutter your space and your life by embracing minimalism. Personally, I don’t take this one to the extreme, but I do try. I recently read a book written by Francine Jay, who describes herself as Miss Minimalist. After reading Jay’s book, I think she’s earned the title. Jay gives simple strategies on how to begin to live a minimalist lifestyle. My favourite idea from Jay’s book involves downsizing by one thing each day, either by donating it, selling it, tossing it, re-gifting, etc. If you do this, by the end of the year, you’ll have de-cluttered an awe-inspiring 365 items. Jay’s minimalist style might be a bit extreme for some; case in point, she states that black is her staple wardrobe colour, and claims she only has 6 pairs of shoes. But her passionate discussion of her process, and her claims about how much lighter she feels after having made the switch to minimalism, may just be enough to convince you to follow her example. The opening of the book is a letter to her “stuff” which, although comical, really compels you to evaluate why our stuff is so important to us. You might even find it a useful exercise to try and write a similar letter to your own stuff. After all, if you can’t explain the benefits of an item to the item itself, it probably needs to go. To get you started, here are a few things you can get rid of to live a more minimalist lifestyle: books (they take up so much space! ), expired toiletries and products you never use, clothes that don’t fit or that you haven’t worn in years, and of course, those extra buttons. 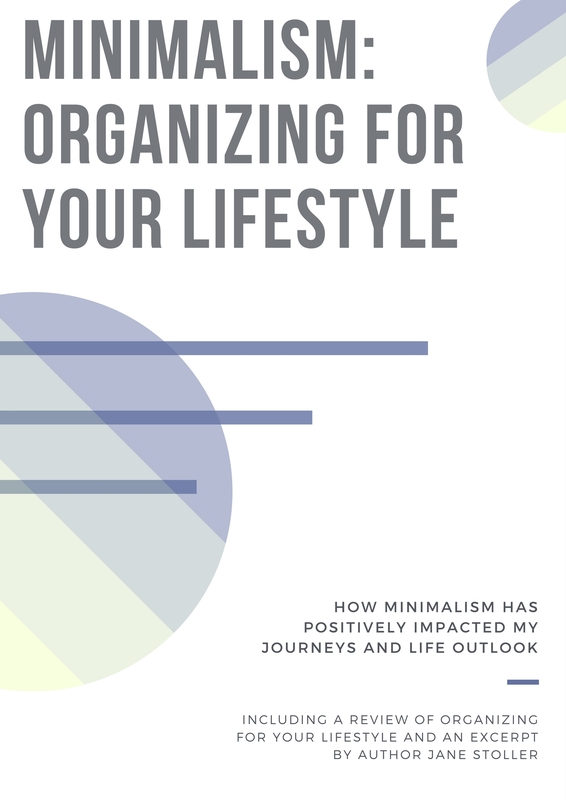 I highly recommend Organizing for Your Lifestyle if you are interested in learning how to embrace a minimalism that helps you get rid of clutter and embrace a more organized lifestyle! You can purchase it from a number of stores, including Amazon! I am preparing to go abroad again, this time for an entire semester. I am going to implement the same techniques to pack for this journey, and I will post about the final result! J How have you embraced minimalism in your life? Do you have any minimalist travel tips? Share them in the comments below! Thank you for the review of my book. I also loved your packing tip about carrying three bags to categorize your items from clothes, beauty/health and electronics. Great idea.